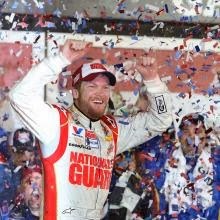 Last night, Dale Earnhardt Jr won the 2014 Daytona 500, his first Daytona win since 2004. This win was especially significant for me as Dale is Horace’s favorite driver and won on Horace’s birthday. While at first ignoring the race, I could focus on the blog post I was supposed to share today, the follow-up to Friday’s DWD Challenge recap. I could zone in and out of the action because I wasn't invested in it. Then Dale joined the crowd at the front of the pack. Blog forgotten and heart pounding in my chest, I watched those final laps with my every nerve on the edge of fraying. My gaze darted frantically among the speeding cars, clenching and wringing my hands when they bunched too close to one another. Having witnessed a number of crashes already, I don’t think I fully exhaled until Dale took the checkered flag...and that under Caution. And as I celebrated with Horace and Dale, something hit me: Investment yields joy. Had Dale not been racing or Horace not been home, I probably would not have watched the race. But had I done so, perhaps to feed Jonan's innate passion for race cars, I doubt I would have been as thrilled when the winner crossed the finished line. But last night I had tears in my eyes and couldn't stop smiling all because a man I've never met reached a long-elusive goal--he's been runner-up in three of the last four Daytona 500 races--to the immense delight of the man I love. And that emotional investment resulted in life-affirming joy. They were so jacked...and with good reason! The 86th Academy Awards are Sunday night, and though excited about these, I will always cherish the 70th broadcast. I worked at a movie theater that season, so I saw all the Best Picture nominees and had strong opinions about the remaining major award. From my perch on the couch, I held my score card tightly in hand as they presented the first award. I remember offering subdued applause when Kim Basinger beat out Julianne Moore for Best Supporting Actress. 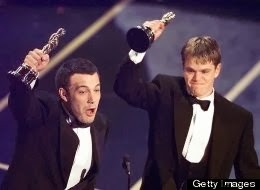 I loved L.A. Confidential—which should have won Best Picture over the juggernaut of Titanic—but felt the performances in Boogie Nights were stronger. Despite my occasional disappointment with the Academy's choices, I watched the entire telecast with zeal, as if my life were on the line. Why does anything matter? Why do we clean our homes, make phone calls, or buy this doodad instead of that one? Because each decision we make tells a truth about our lives. Some truths are trivial—I prefer jam to jelly because the latter never stays were you put it—but others are defining and reflect where our hearts (and thereby our lives) are invested. Tonight at 10:00, I will watch the dazzling and defiant James Spader in NBC’s The Blacklist. Beyond its considerable entertainment value, The Blacklist is worth a weekly 60-minute commitment because it’s one of four hour-long dramas Horace and I watch together. And any quality time I spend with my husband is automatically priceless and more than worth the investment. I am a Christian, and to me, that means more than punching a religious clock once per week to “get my blessing.” Cultivating a thriving, healthy relationship with Jesus Christ involves time, energy, and the very essence of my life. And like the experience of watching Dale win at Daytona last night, making that investment yields a continual return of joy, strength, and peace I would never otherwise experience. Where are you invested? What gets your blood pumping and your emotions engaged? Does it add value to your life or cause your personal stock to plummet? Whatever it is, make sure you count the cost to make sure you’re getting the most bang for your buck. Your cup of joy depends on it. And congratulations again, Junior. 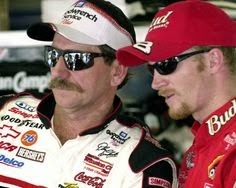 The Intimidator would be proud.